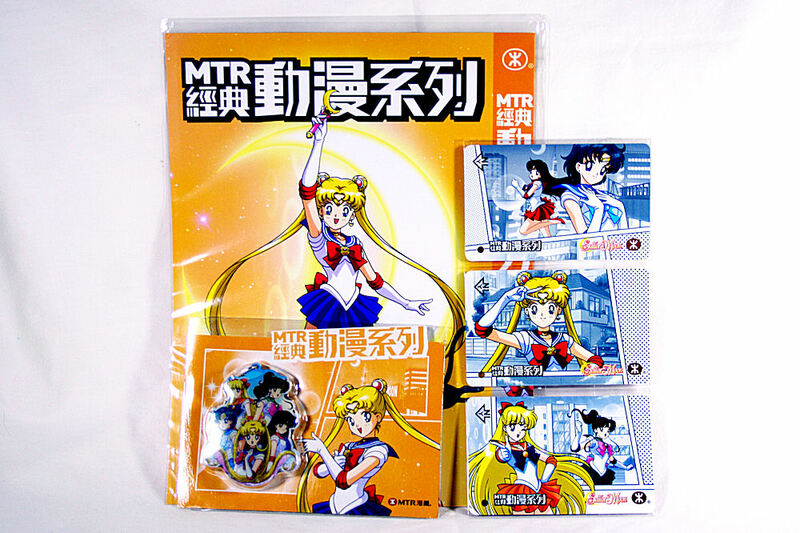 Hong Kong MTR Train Passes – MoonFigures Collection, Art, and Reviews! In 2011 a rather random announcement that seemed to go along with the revival of Sailor Moon came out of Hong Kong. 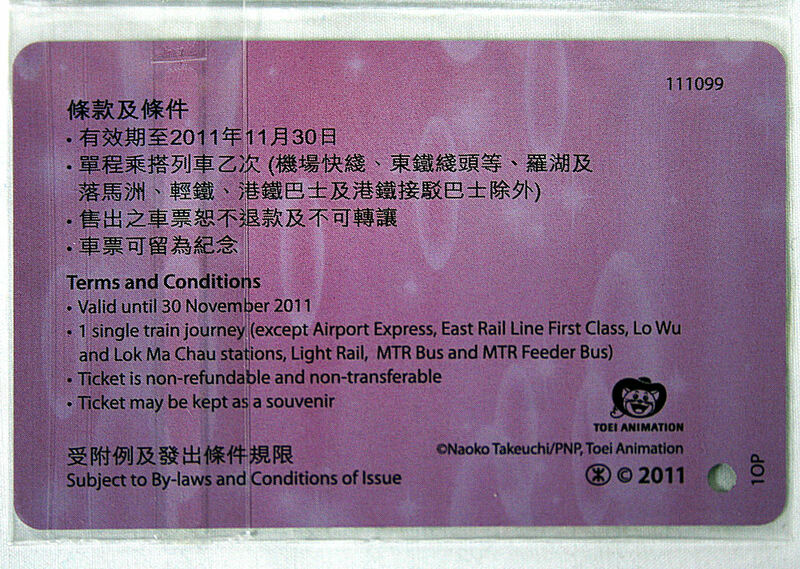 Mass Transit Railway (MTR) announced a limited edition set of transit tickets, a holder, and keychain would be released for three consecutive weeks starting October 2, 2011. The tickets were actually valid for 1 train ride until November 2011, but the set I purchased was unopened and appear to be unused (I’m not sure if they done anything to consider them used). 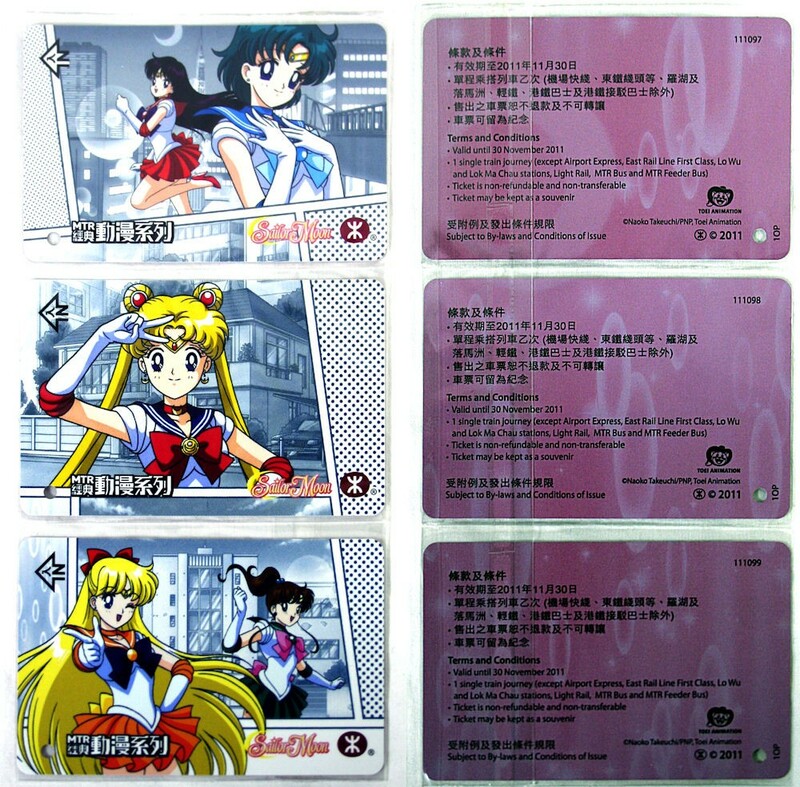 The tickets feature Mercury, Mars, Jupiter, and Venus paired off, while Sailor Moon gets her own card. The backs are exactly the same, with information about how the card should be used, and that the card may be kept as a souvenir. Here’s a bigger edit of the card for readability. The pamphlet above is actually the ticket holder. This is the front of the book, as well as the side panel. The art and logo are from season 1 and probably redraws of old artwork by Marco Albiero as part of the original Italian revival. Back of the ticket holder including copyright information, and the TOEI sticker. Funny enough, the sticker is white and red, and not actually metallic like the stickers we’re use to seeing. The inside spread. Left side features the slots and layout for the cards (the white lines match the panel lines on the cards). The right side features some text and another Sailor Moon piece. I’m not sure what the text says (anyone care to translate?). There are slots for the cards to fit in, but just a general idea of where they should go. The key chain is what most people really wanted from this promotion. It was one of the first things we seen outside of Italy with new artwork on it, and everyone seemed pretty happy with the quality. Ironically enough, this exact image is printed in sticker format by GE Animation in North America and I have it in the center of my laptop back. The card and plastic cover are an ok packaging. It’s not very secure, and the card is cut creatively so that the top doesn’t quite fit the plastic all the way around… but it has held just fine for 2.5 years, so I guess it works! Back of the card, including the TOEI sticker… which, for some reason is white and red, instead of metallic silver or gold. The actual key chain is super nice. It seems high quality, though I’m not brave enough to actually use it, but I imagine it has lasted well for those who have used it. Overall I recommend this set to anyone who is interested in it. It’s displayable with the card holder, usable with the key chain, or just a nice keepsake. The price tag I’d recommend is around $30-$40 USD, though $40 is certainly my cap. It just doesn’t have what Sailor Moon fans are looking for in order to sell higher, and it’s not really a desirable piece in the fandom (in fact, I think many have forgotten about it). All in all, I’m glad to have purchased it.